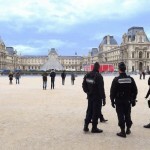 French police charged with protecting vulnerable sites like shuls after January’s deadly Charlie Hebdo attacks are registering dissatisfaction with the not-too-exciting job in the only way they can: by calling in sick. Riot police are not allowed to strike, so a plague of faux-illnesses has taken down dozens of bored cops in recent days, according to French media outlets. One expert said that instead of patrolling buildings, the affected officers want to spend more time on exercises preparing for potential future terror plots. Read more at The Washington Post.